This round equinoctial dial is engraved on the top of the lid with a coat-of-arms and, on the edge, a Greek inscription wishing long life. The engraving style of the Greek inscription differs from that on the rest of the instrument. 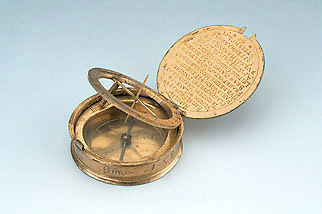 The inner side of the lid has a table of cities and their latitudes.